Aeon Rises is Available on Amazon! Click on the link below to get your copy of my new Young Adult / Middle Grade science fiction adventure novel, Aeon Rises. ​Justin Madrid always considered himself an average nerdy freshman in high school, and an outcast because intense migraines prevent him from playing video games or watching television. Even looking at a phone screen hurts. But when the aliens, disguised as local librarians, started trying to kill him, everything changed. And now it is up to Justin and his cool new power to save the earth from invasion. The editing process is complete,l we have an amazing cover art design, and a new title for my new young adult science fiction novel. All we need now is to hear back from the publisher about when it can be released for sale on Amazon. Justin always believed himself to be a typical nerdy kid, until the aliens tried to kill him. That was when everything changed. This book was a ton of fun to write. Justin Madrid, the main character is, for all practical purposes, your average teenager, with one exception. every time he tries to watch a computer screen, television, video games, or other electronic video screen, he develops a terrible migraine. As a result, he cannot join his classmates in many of their favorite activities or participate in their everyday discussions about their favorite shows or games. He is an outcast. His only real friend, Kevin Samson, are both huge fans of movies from the 1980's and '90's. So much so, that they often communicate entire trains of thoughts and emotions to each other through quotes from those films. Together, they learn aliens are indeed here on the Earth, posing as librarians. They are intent on taking over the human race, hack their brains, and use them as a military force to overthrow the alien's home world. Stopping these evil librarians is the job of another group of extraterrestrials, also here on Earth, and working secretly with our government. Justin and Kevin soon learn that they too are instrumental is ending the threat, and Justin himself is the key. His migraines are not what he always believed them to be. In fact, he is not what he always believed himself to be. And what is really going on at Area 51 and Denver International Airport? If you enjoyed the iconic references to the video games in Ready Player One, then you will love the references to all the famous scifi movies in Aeon Rises. More to come when the release date is announced. Stay tuned. "I'll be back." My latest novel, tentatively titled "Justin vs the Alien Librarians" is about to begin the editing process! After a year of writing, and leaving The Brin Archives behind for now, I have made an attempt at my first Young Adult scifi novel. In this new adventure, a teenager, an outcast at his school due to his inability to play video games, learns he has strange abilities which make him the only person in the universe who can stop an alien invasion of the earth. The invading aliens have taken over a local library in Aurora, Colorado and plan to transfer the brain wave engrams of their co-conspirators into the minds of earthlings, then return with this new army of enslaved humans to start an uprising on their home world. More details to come as the release date approaches. The Brin Archives scifi trilogy is now complete! In Empyrean, Jim Cronin brings down the curtain on the wonderful and fascinating Brin Chronicles. Having been privileged enough to have read all three books, I can honestly say the author has done a tremendous job of tying everything up nicely and leaving this reader, anyway, extremely satisfied. I couldn't help but give myself a wry smile as I realised Cronin had indeed left a tiny hole for the possibility of a fourth book, but that having been said, if the Brin Chronicles ended with Empyrean, that would be just fine. 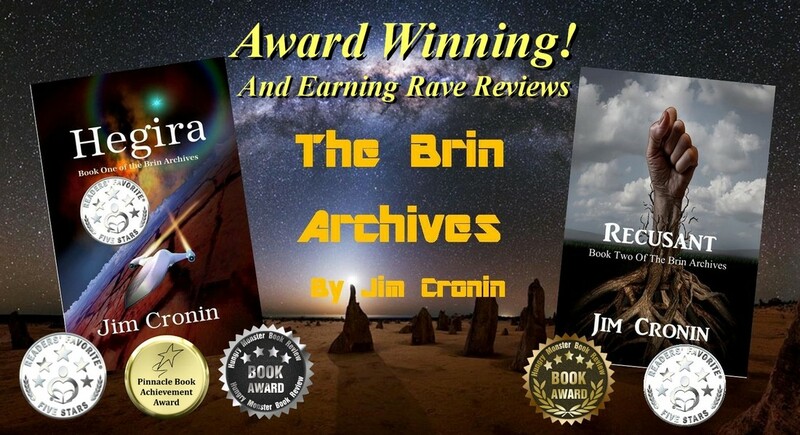 Empyrean is book three in The Brin Archives series by Jim Cronin, and is an action packed, delightful read. For fans of sci-fi, this will be a great treat. The reader is transported to an interstellar world with two powerful empires set against each other in the struggle to capture and control the power of a black hole in the galaxy. The Skae Empire believes that this could ensure a constant supply of energy to the planets, but the Gorvin Empire thinks the scheme could cause greater damage, destroying half of the planet. It is in this context that powerful heroes must dig for the truth to find a permanent solution to the interstellar wars that have gone on for centuries. Follow Maliche and Jontar Rocker and their companions as they embark on an epic journey in search of the truth. The outcome is far from anything the reader could imagine. This is an interesting story that is well-plotted and well-written, a story with an exciting setting. Jim Cronin has the gift of uprooting readers from their immediate reality and plunging them into worlds that are strange and yet make them feel as though they were a part of that world. The writing flows beautifully and it is enriched by vivid descriptions and exciting dialogues. Beginning a story in the midst of a crisis is an intelligent way to grab the attention of the reader and I couldn’t resist reading on. In fact, the conflict is one of the strongest elements of Empyrean and it is developed with great skill. I loved the strong characters, the quick pace, and the compelling plot points. It’s a great read. Hegira and Recusant are earning more awards! Recusant is now available on Amazon! Her nose became insensitive to the stench of bodies during her confinement in the dim bunker long ago. The deep space images on the screen before her revealed the devastation of their fleet in their encounter with the Gorvin. Two hundred top-of-the-line war cruisers had been completely destroyed, another three hundred fighters were out of commission. She watched as the overwhelming forces of the Gorvin plowed through their defenses like an energy blade through a cloud, and were now aimed straight at Kodut, their home world. On the displays, a second line of vessels, the laser launch ships, took up their attack formation. A cloud began to grow ahead of the ships as they deployed their weapons. 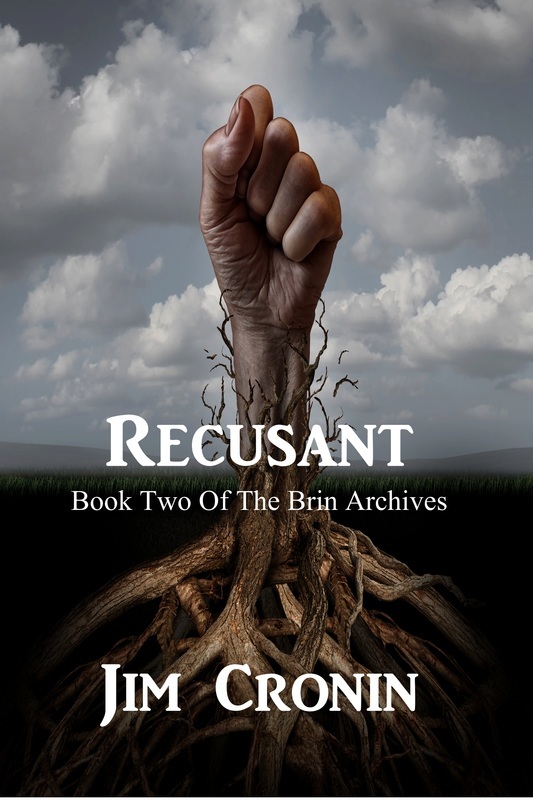 Recusant (The Brin Archives Book 2) is an entertaining and gripping read. The story itself takes place a long time after Karm, Jontar, and Maripa guided their people from the brink of extinction. 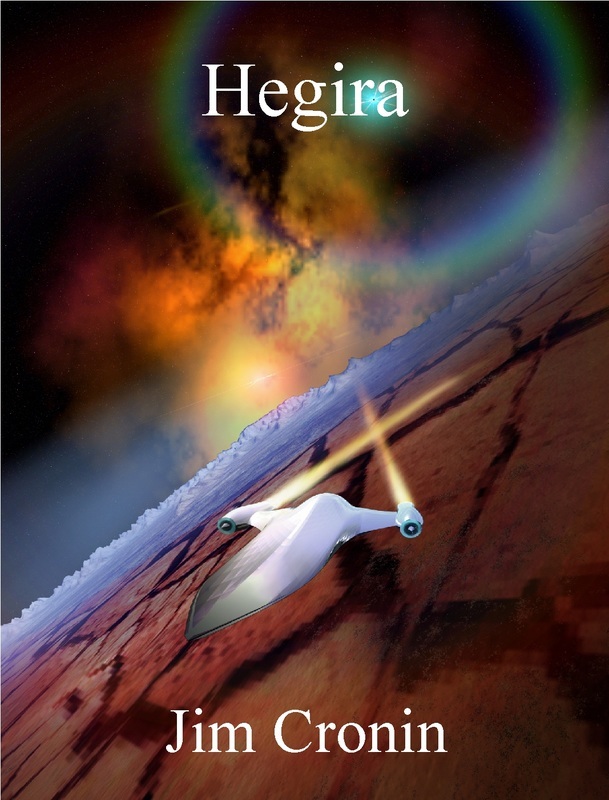 Whilst no knowledge is needed of the previous book, Hegira, I thoroughly enjoyed learning of the events which shaped the Brin's future on this planet. The manner in which the past was relayed was a stroke of genius; believable, interesting, and fitting in with the characters and plot development. Once again, Jim Cronin creates a cast of diverse and vivid characters, equipped with engaging dialogue and fully developed personalities. There are so many threads to this one tale, with hidden connections, plots and schemes, that it is impossible not to get ensnared. I knew I would love Recusant, book two of the Brin Archives series by Jim Cronin, as soon as I had finished the prologue. I had read a similar end of technological advancement scenario in a David Weber series and the aliens and themes are different in Recusant. In my very personal opinion, Jim Cronin writes as well as David Weber, which is just about the greatest compliment I can give Jim Cronin because David Weber is great! The set-up and execution of what is obviously going to be a satisfying long and well written series is perfect. This is the second book and I'm dying to read the first one and can't wait for the next one. Recusant is very well written and very well thought out. The Brin are evolved from birds and I can't help but wonder if the name Brin is a tribute to David Brin who happens to have written the best description of an intelligent avian culture I have ever read...up until now. If you love good science-fiction, Jim Cronin is a name you want to remember. 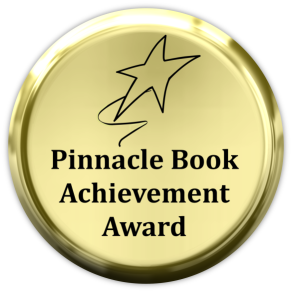 Hegira recieves NABE Pinnacle Award! Click on Hegira's Cover to read a preview! ​Read Hegira's Reviews: 4.7 out of 5 stars on Amazon! His species became extinct decades before the aliens rescued and cloned him, but he still must do everything he can to save them all. Karm must travel back in time, create the most powerful financial empire ever seen on the planet Dyan’ta and assemble a team of experts who must be kept in the dark about his plans for fear of upsetting the timeline. Dr. Jontar Rocker is an up and coming geneticist whose untested and controversial theories on cloning become the lynch pin in Karm’s schemes. Maripa, Karm’s petite and beautiful surrogate niece, personal secretary, and deadly bodyguard must learn to trust Karm despite his deceptions and secrets. Can the emerging love between Dr. Rocker and Maripa survive the demons and surprises of their own past, as well as Karm’s impenetrable air of mystery? The lieutenant pulled himself up in the chair and reached out with a fractured, bloodstained talon to press the door release circuit. With a sharp hiss, the door slid open and in hobbled Sergeant Vedak, one of his few remaining platoon members. “It worked, sir,” the soldier said, crashing into the second chair in the room. “Look who’s talking,” said the young soldier. He tugged at his uniform, checking his wounds. “We got most of them sealed in the lower decks and opened the cargo hatches to space. They didn’t stand a chance once we decompressed decks one through ten. They’re all dead now. Just a few survivors are holed up one deck above us.” Ripping a piece from his ruined shirt he wrapped the makeshift bandage around the laser shot in his arm. The two sat in silence for several long minutes before either could speak. “That looks pretty bad, sir. Want me to look at it?” Vedak pointed at the lieutenant’s shoulder, still bleeding heavily despite the thick bandage he pressed against it. Lieutenant Yardef shrugged his shoulders, his face contorting at the new stab of pain. “Don’t ask me, Sarge. The older man shook his head in silence. “Nothing but static so far. I’ll …” He coughed again and dropped to the floor. “Lieutenant!” Vedak jumped out of his chair and fell to his knees, lifting the lifeless body of the officer. The sound of sporadic energy blasts tore his attention away from the dead lieutenant. He checked the monitor and stumbled to the intercom controls. “What’s going on out there, soldier?” he demanded of the man he saw on the camera. The bright orange flash of a laser blast missed the soldier’s head by inches. The sergeant lunged to the floor, grabbing the microphone in his shaking hand; the last remnants of his self-control dissolving rapidly. “Latonia Base, this is Hegira. I read you,” he responded. “Praise The Eternal!